It wasn't so long ago that these unique flowers would have been found on much of the valley floor, but development has covered most of the original range of the Coachella Valley Milkvetch, and today it is an endangered species. As you can probably guess by the name, it's endemic to the Coachella Valley - it grows in the remaining sand dune habitat here in the valley, but nowhere else on Earth! Coachella Valley Milkvetch is flowering right now on the Kim Nicol Trail, accessed via Corkill Road off of Dillon (directions). This trail opened just last year and was a joint effort by Friends of the Desert Mountains and the Coachella Valley Mountains Conservancy. Milkvetch grows all along the trail, but you can reach the largest group of them by following the trail to the left (counterclockwise), about one and half miles in on the loop. Continue on and you'll find plenty of desert sunflower (Geraea canescens) and Fremont's pincushion (Chaenactis fremontii), as well as sweeping views of the surrounding valley and a chance at spotting a Coachella Valley fringe-toed lizard, another endemic and endangered species unique to the valley. Unfortunately, you can also expect to see plenty of invasive Saharan mustard (Brassica tournefortii) along much of the trail. Most of Box Canyon Road through the Mecca Hills Wilderness is closed, but you can still reach Painted Canyon (directions) via a dirt road that is passable by most vehicles (use caution in cars with below-average clearance). The wildflowers are spectacular all along the road, including some giant Arizona lupine (Lupinus arizonicus) and desert poppies (Eschscholzia parishii). There are a few Mecca aster growing in the deep shade right at the parking area, but turn around and explore the base of opposite canyon wall to find dozens of these rare plants - found only among the winding slot canyons of the Mecca Hills Wilderness - in bloom. It's always worth a trip to visit the Dos Palmas Preserve (directions), a little-known desert oasis hidden near the north shore of the Salton Sea, but now is a particularly good time to visit. There are fields of flowers blooming along the road, including sand verbena (Abronia villosa) and brittlebush (Encelia farinosa). From the parking area, you can take a short walk through San Andreas Oasis, or a longer walk down the road and explore tens of thousands of California fan palms (Washingtonia filifera) - the only palm tree native to California. Keep an eye out for stream orchids (Epipactis gigantea) around the oasis ponds - there were new shoots (but no flowers yet) sprouting when I visited last week. 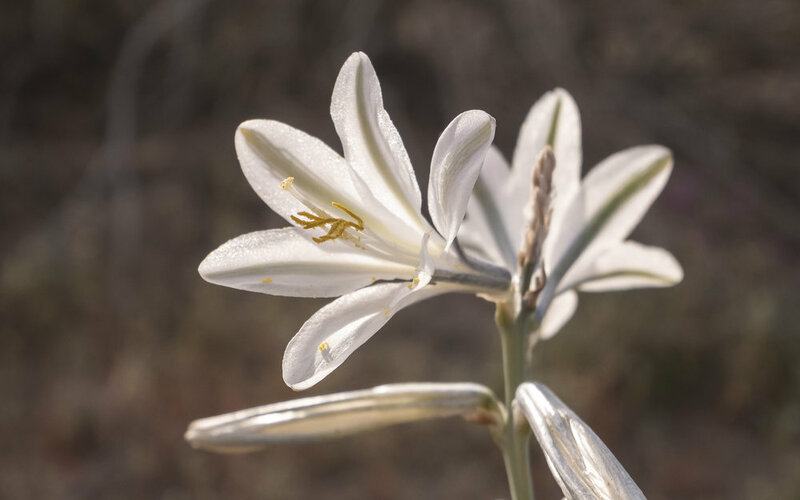 As you get close to the Salton Sea, have your passengers look for large white flowers along the highway. These are the desert lilies - singular blooms unlike nearly anything else that grows in the desert. Lillies live most of the time as bulbs deep in the soil waiting for the rain and in the wettest years - like this one - emerge and bloom en masse. By now you've heard and seen all about the "super swarm" of painted lady butterflies (Vanessa cardui) that has descended on Southern California. The adult butterflies feed on wildflower nectar (pollinating the flowers in the process) as they migrate, and the caterpillars feed on the fresh leaves of annual plants. So, the blooms and the butterflies are linked - we can't have one without the other. Many of the adult butterflies that I've seen are looking pretty tired, staying close to the ground with broken or frayed wings. They may stick around long enough to lay eggs and produce a new generation of painted ladies that will continue their relay journey, following fresh wildflowers up California (and beyond). Another member of the lepidopteran order (butterflies and moths) has also started to grow in number here in the Coachella Valley in the last few days. These are the white-lined sphinx moth caterpillars (Hyles lineata), which are starting to munch their way through the leaves of brown-eyed primrose all over the desert. We may be on the verge of another "swarm" - these large black and yellow "horn worms" can sometimes hatch in the millions, covering the desert floor (and roads) as they search for enough food to grow and transform into moths. You can help us learn more about these unique creatures! I'd like to try an impromptu little "crowd source" community science experiment and answer the question: what causes sphinx moth caterpillars swarms? Just use your phone to take pictures of any caterpillars (or adult moths or butterflies), and submit them to www.iNaturalist.org, or email them directly to be me at cwbarrows@desertmountains.org. I'll follow up in a few weeks with the results!